This week's fancraft is an article submitted by Rival Guy. There's an escalation to joking that happens between friends. It's not enough for each joke to be met with a witty response, the response has to escalate the back and forth. Most people perceive a limit to this escalation, but sometimes people over-commit. Sometimes when they over-commit, they wind up writing Orcish pop music. I had been joking with Matt Vancil about the portrayal of the Orcs in Journey Quest season 2. 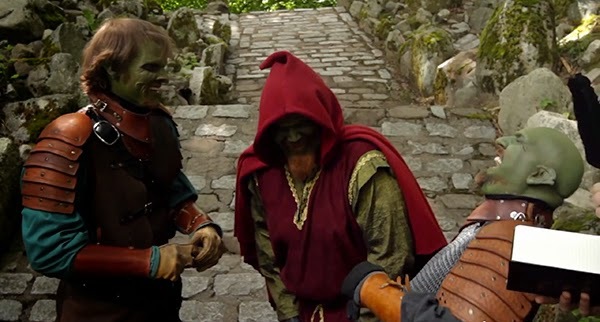 Soon, I began berating him for how regressive the show was in its treatment of the poor Orcs, showing them only at feudal level of cultural development, and in so doing, reinforcing negative stereotypes of green-skinned barbarians. Why not show Orcs how they are today? Why not play the music that modern Orcish youth listen to? Surely this would be a more positive, more conciliatory portrayal than even Jesse Lee Keeter's brilliant performance. It's at this point that I over-committed. I've composed as a hobby since middle school, and I'd recently acquired some better composing software than the program that I'd been using...well, since middle school. Feeling inspired, I went home, wrote the lyrics (in English) and started thinking about the sort of arrangement I wanted to do for the song that was just starting to take shape. I sent my English lyrics to Matt. He was a sport, and translated them to Orcish for me. With the proper lyrics in hand, I was able to really work out a melody, and build a song around that. I decided to open with a brief vocal segment, as a nod to Steve Wolbrecht's great “Warrag! Orkulz Aggax" (We Are the Orcs, hear it over the credits of JQ2e09), and to go for a pop-rock arrangement for the bulk of the song. With all the pieces in place, I sat down and scored the song. Thus was born “Kit no Morfiart” (Winter with Me), the world's first, best, and only o-pop song. As of the writing of this story, it still has yet to be performed by a live band, but hopefully that will change soon. With the score now available (click the link to go to a downloads folder) as a Creative Commons attribution non-commercial license, maybe you reading this will be the first musician to over-commit yourself and record it! Fancraft posts will be released every Wednesday (subject to content). Do you have a fancraft story that you'd like to share as a guest writer? Send your proposal to LMG@zoefan.net.